Fifteen weeks in and I still feel like I'm finding my footing in seventh grade. There are certain parts of the day that feel no different than elementary school. Other portions make me wonder if I've landed on another planet. It's hard. My brain hurts. I never feel like I have enough time. I question on a daily basis if I'm teaching the right lessons, the right units. I wonder if what I'm doing is helping the kids grow or holding them back. But I try. Some days, I find a bright spot. Today was one of those days. I've done a Mock Caldecott for the last several years with Margie Myers-Culver. This year we are teaming up again. The students will have much less time, and it will be a more independent unit, but I'm excited to begin. Today I began by handing out a packet where the students could take notes and analyze the titles that we selected for this year's Mock unit. I explained the timeline of the unit and said that we'd begin together with one of my favorite picture books of the year, Jon Klassen's We Found a Hat. There were several cheers, I had read the first two books in the trilogy - I Want My Hat Back and This is Not My Hat to these same kids in fifth grade. The kids circled up, made observations about the book, and scribbled notes down recording their thoughts. I then gave them some time to grab a book from our nominees and read it alone or with friends. I wondered how seventh graders would react to this assignment. They were a trip. Many told me it was their favorite day of the year. I heard shouts from the back corner as two girls experienced They All Saw A Cat for the first time. Three boys in one class told me that Secret Subway was amazing. Many kids in all of my classes chortled with laughter at This is Not A Picture Book. At the end of fourth period I paused for a moment. Taking the time to look over the room I realized I wasn't as far from the world of fifth grade that I sometimes imagined. These kids of mine were sharing, laughing, and enjoying picture books. Their joy filled the room and made my heart just a bit lighter. Picture books, they are for everyone. Five years ago I wrote my first blog post. Let's be frank, before that my writing had been seen in my journals, papers turned in to teachers, and no where else. I was not a writer. My papers returned to me in school bled, reminding me of my failure as a writer. Grammar eluded me, punctuation confounded me. My voice wasn't one that I used, I did not want to be noticed. I retreated into my world of books and felt hope. I tried hard not to be noticed. That all changed with a conference. NCTE in Chicago gave me the nudge, or the forceable shove, I needed. I left realizing that I was a decent teacher of reading because I was an avid reader. 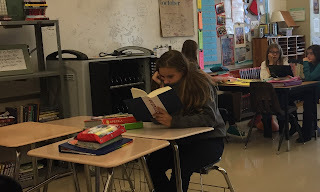 I could recommend books to my students and use them as the basis for our connection. I didn't ask my students to do senseless reading activities because I knew that wasn't what I did as a reader. But as a writing teacher I was a bit of a fraud. I couldn't figure out what to tell my students when they experienced a block because it had been so long since I was there myself. Through this blog, that changed. I began to write - first here, then for Choice Literacy, then even more. My teaching changed. I was able to help and connect to my students on another level. Truly, my identity changed. The person who tried so hard not to be noticed was still there, but I had found my voice. I began to pay attention, to open my eyes. To realize that I had a greater purpose. Through writing I could speak up, to act. Being passive is my nature, but sometimes that is not what is needed. Staying quiet is the easy choice. It's much harder to choose to speak up, people do not celebrate that - especially when their views run contrary to yours. I see it on Facebook daily - friends commenting that they are "cleaning house" and removing anyone who is posting political "crap." That Clinton supporters need to move on, grow up, be quiet. If it was just that my candidate didn't get elected, I could handle it. That's happened in the past and I've move on quickly. I've long argued that we need to come together to support whomever is elected, that they are "our" president. That we all need to want them to succeed. So, the fact that Clinton lost is not why I feel sick to my stomach. The fact that hate seems to be winning is. My friends that are imploring people on Facebook to return to our regularly scheduled social media world share a common trait - and I share it too. We are all White. If I could get them to listen I'd beg them to be open, to read, to talk, to feel. I cannot watch the hatred towards gays, Muslims, refugees, Blacks, Native Americans, and...and...and... and not speak up. I can't see the hate thrown at a Muslim, to say that the Internment Camps of our past weren't a bad idea, and not think of a relative that was in those camps. I cannot see homosexuality decried in the press and not think of the student who hugged me on Monday morning upon returning from NCTE and said she felt "safe" around me. I cannot watch the raised hands saying, "Hail Trump" and worry for the future. This past week I was in Atlanta. I went to the Center for Civil and Human Rights with friends. I walked the floors, reading about Emmett Till and weeping when I realized he was Luke's age. Looking at the rows and rows of mug shots of Freedom Riders and feeling pride that they had stepped up when they knew it was important. And then I came upon a lunch counter. The docent told me it was an "immersive experience." I was to sit down at the counter, put on the headphones, close my eyes, and place my hands on the counter. I did as she asked. Almost immediately the room fell away. The sounds of a diner filled my ears. Then an angry voice came behind me, and another. They were saying hateful things to me. I opened my eyes and looked. It felt like someone was towering over me. No one. I closed my eyes. I was back in the diner. The words continued, then a shove, a kick. My chair vibrated and terrified me. I opened my eyes. I wanted to take the headphones off. It had been a minute. I closed my eyes again. I made it ninety seconds before removing my headphones. By that point the tears were streaming down. The docent handed me a Kleenex and said not a word. What I couldn't shake, what I still can't shake six days later is that I could take the headphones off. If I wanted to I could clean house on Facebook. I could remove anyone from my newsfeed who insists on sharing undesirable news. I could pretend that the world is fine, we are all being treated with equal respect, that the future is in good hands. That is my privilege - it is white privilege. It is one I do not deserve. Each day I am learning. I'm trying. I'm not perfect. I have no idea what to do, but I'm trying to be open. I'm trying to educate myself. I'm trying to use my voice. I do not fear Republicans, I have family members and friends who identify as members of this party and I love them all. What I do fear is people who operate with hate. I fear people who believe they are better than others because of their sexuality, race, or social class. I fear those who want to silence the voice of those they don't agree with. I worry that speaking up is not enough. It might mean that some of my Facebook friends unfriend me, but I cannot look in the mirror and be silent. I have too many relatives, too many friends, too many students that are a target for hate right now. My voice is here and it's ready to be used. So, on this five year anniversary I can say I'm grateful for this blog. My little corner of the universe has taught me so much. More than anything, it has been a place to reflect. It has made me open to admitting I don't know the right path, but am willing to try and learn. Thank you all for being a part of this journey. To celebrate, I want to give away a book. This is a copy of A Poem for Peter, one of my favorite picture books of the year. Thank you for allowing me to use my voice. Please use yours as well. This conversation needs to continue. Nerdy presentation - picture by Colby Sharp. I had a hard time getting ready for NCTE this year. My heart was heavy and I began to feel that I needed to stay home for a variety of reasons. Even Wednesday morning as I threw my bags in the van, I questioned if I should go. I decided to go ahead. I had no idea how much I needed it. 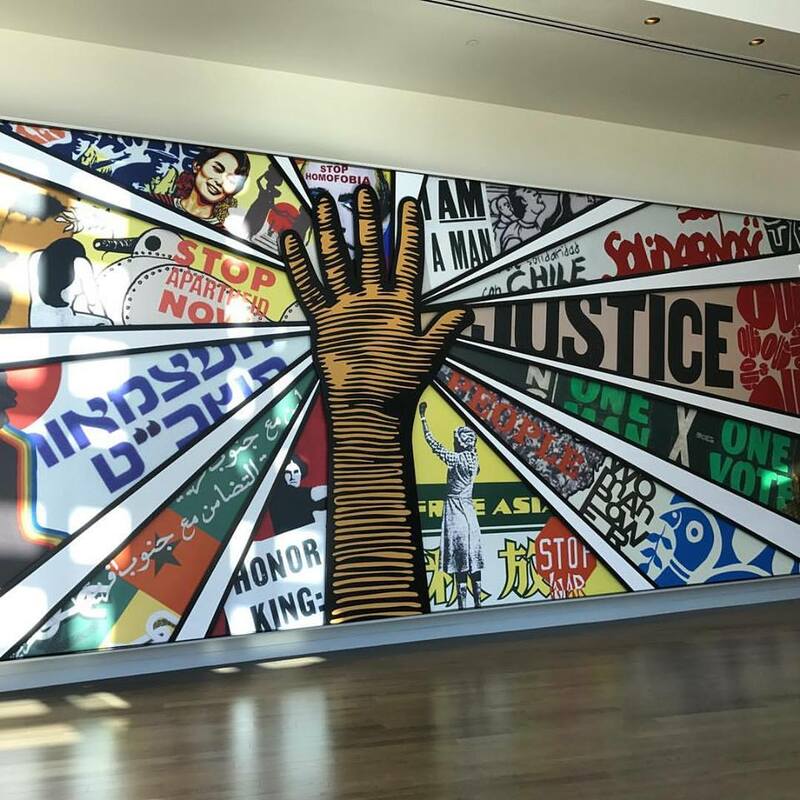 Side trip to the Center for Civil and Human Rights. WOW. I really am not a huge fan of traveling. A homebody at heart, I love being at home in my pajamas, reading, and relaxing. I love being surrounded by my family. I abhor flying. All of this comes together to make it difficult to leave. This year was intensified for a variety of reasons. So when I saw my first teacher friend in the airport, I almost cried. By driving three hours, flying for two, I knew I would be surrounded by my tribe. These people - the teachers, authors, illustrators, and publishers - they get it. They know that the kids are why we are all here. That the children in this country are our best hope. That in them I see a bright future, and I need to cling to that now more than ever. Sara and Teresa. My heart is happy. When I see friends, especially those I haven't seen in awhile, I often hug them. It would be next to impossible to calculate the amount of hugs I've had while at NCTE thus far, but each one has served the purpose of easing my anxiety just a bit more. One of my roundtables photographed, thanks Kristin Ziemke. I've seen amazing teachers and presenters, wonderful authors and illustrators, colleagues and mentors. I've given two presentations, attended so many, and been inspired by all. While I miss my family and am beyond grateful to see them tomorrow, I'm so glad I came. 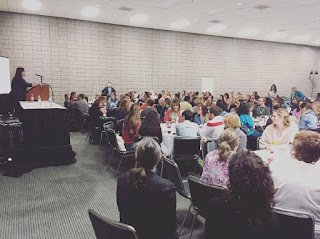 NCTE reminded me to hope, to love, and to continue doing what I'm doing. It was the perfect way to spend the last few days. What it's all about - a kid book talking a book to a guest at my roundtable today. I feel like dancing around singing It's the most wonderful time of the year... That's right, it's NCTE. I love this chance to see colleagues and get recharged. 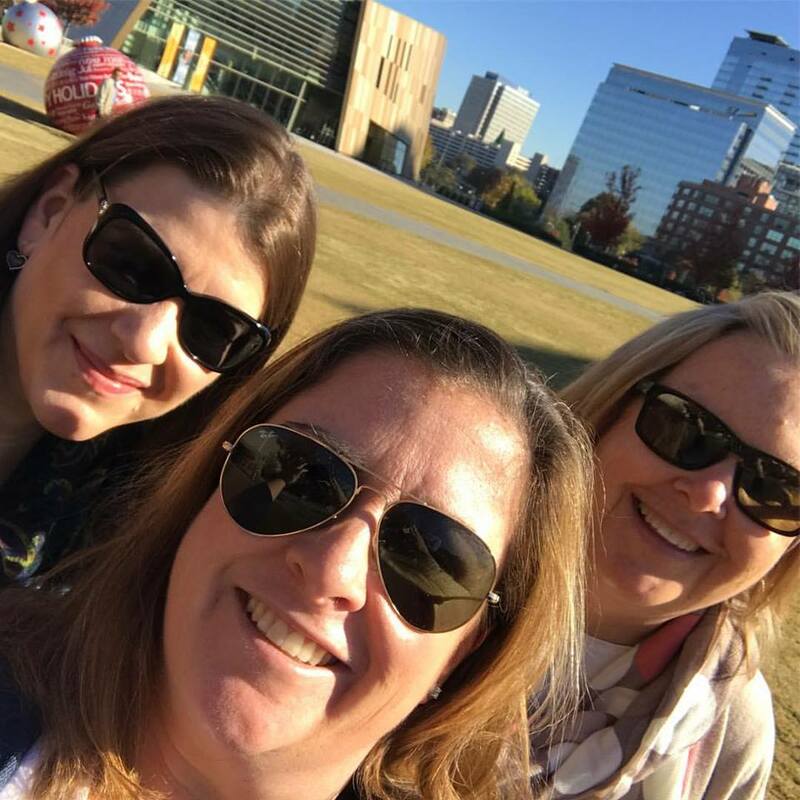 I arrived last night and had the opportunity to get up early today and check out the Center for Civil and Human Rights Museum right next to my hotel. If you are ever in Atlanta, I highly recommend it. Then we headed to our first session. With folks in it like Tom Newkirk, Tom Romano, Penny Kittle, and Jeffrey Wilhelm, it was an inspirational way to begin my conference. Now to get ready for dinner and a full three days ahead. If you are at NCTE, I'm presenting at two roundtables and would love to see you. I walked my dog this morning thinking about how we move forward. Thinking of what I can do to heal a nation as one person is overwhelming. That's just not possible. So what do we do? As a teacher, I think I need to continue the work to help my students be critical thinkers, to find a love of reading and writing, to know who their best self is, to remind them to be kind. As I wrote about the other day, I've been working with my students to see how our judgements create a "single story" for others, when we are all more than that. Using work from Jessica Lifshitz we have examined what our beliefs are when we assume, when we judge, when we only listen to one side of the story. This has been a hard unit. I think most of us, or at least most of the people I choose to surround myself with, would say they aren't sexist, racist, classist, etc. However, if you can be really reflective, truly honest, there are often hidden biases that maybe you aren't even admitting to yourself. That's what we want to confront and explore. In doing that work, we can grow. Of course, like everything else in this world, that is easier said than done. What I've been impressed with, however, is how willing seventh graders are to do this work, to dive in and have tough conversations. Not all of the kids, but more than I anticipated. One thing we've all come back to, however, is what is our own single story. One of my students said it first, that he knew the single story others thought of him wasn't good. I was surprised, I love this kid. But he persisted, saying that he was rude at times because he'd rather not talk to others. He didn't have patience for middle school drama, but he didn't want to be known the way he was. We talked about how we can, to some extent, shape what others believe about us through our words and actions. We help to make our own story. I hope my students walk away from the last few weeks with an understanding that we all are more than the boxes you could fit us in. I could be classified as white, middle class, Catholic, and female, yet I'm so much more. So are you. I want to have my students push past the stereotypes and what some of the media choose to rain down on us as fact. And in a time many of us have a feeling of hopelessness, I want to remind them that their actions and words matter. Hold the door open for someone. Sit by a kid at lunch that is alone. Give kind words to the classmate who had a bad game. Stick up for the kid that is being targeted. We make this world we are living in. We get to choose who we surround ourselves with in our small circles. We get to choose how we react to others, especially when we are afraid. Let's hold each other accountable for how we treat each other. Let's move forward with love and kindness. I will be continuing along that path today. This week we wrapped up a double unit in Language Arts. We used some idea from Jess Lifshitz on teaching kids to see beyond the single story. (Check out her links here.) And we did a shared read of The Outsiders, still thinking about that single story - in this case of the Socs and the Greasers. It was a lot. I'd never read The Outsiders until this summer. I knew that it was a book we'd share in my move to seventh grade, so I bought a book, a t-shirt, and read it on the way to our summer vacation. When I posted a photo on Instagram while wearing said shirt, many former students went nuts, commenting on how much they loved the book. My son, Luke, looked over my shoulder to see what part I was on regularly. He couldn't believe this was my first read of one of his favorites. I tried to explain, I knew as a kid that it was "sad", and I was not a kid who liked to read sad books. I hadn't seen the movie for the same reason. After reading it, though, I got it. What a beautiful book. Sharing it with three groups of kids was a special experience this year. Watching the movie with them, however, was another level. It really was a brilliant movie adaption from a book, but for the first time in a long time, I realized the side of life I was on. I'm certainly middle aged, but wow. These icons of my youth are older than I am, but I could see here the kids they once were. Some aren't even with us anymore. The kids laughed at me because I only cried once, and it wasn't where they expected it. Not at any of the character's deaths, not at the end, but right in the middle when Ponyboy recites Frost's poem to Johnny. And with that, I wept. Looking at my fabulous students, I was struck with the fleeting nature of childhood. We've lost several members of our community this week. One gone far too soon. My emotions have been running on high, so that absolutely contributed. But looking at my students, realizing it has been thirty years since I sat where they do, yet it seems like yesterday. My heart broke open and the tears escaped. I was left with the sense of gratitude that I, like Pony, have never grown tired of appreciating a sunset, of finding the good in others, of diving into a book. 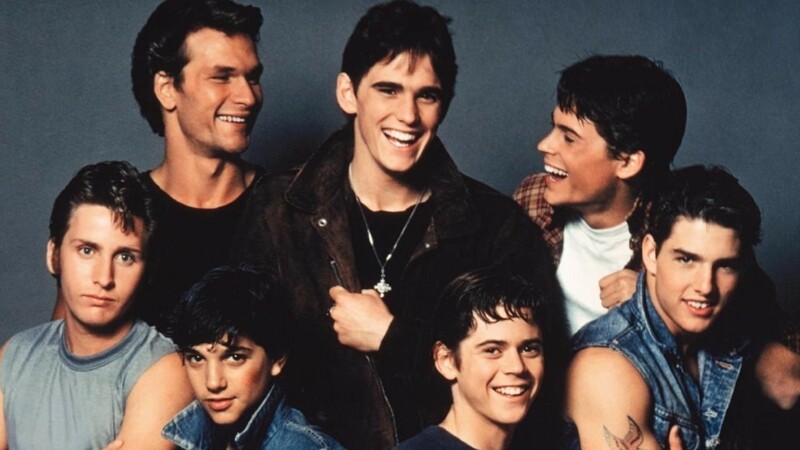 And while I find it hard to believe I've reached the age of 42, I'm grateful to movies like The Outsiders that can make me return to my youth, if only for a little bit. Now to find Rob Lowe's autobiographies. I had forgotten how much I enjoyed him. Disclaimer: I was hesitant to write this post, not because I don't believe in it, I do. I just don't usually talk politics. I am today. If you'd rather not read it, I totally respect your opinion and feel free to skip this post. I think it's important that we begin talking, respectively. This is my step forward. Thanks for understanding. The morning after. Still a beautiful world. Well, today was rough. This election year has been unlike any in my voting history, which is 24 years long. I've had candidates I've voted for get into office, and others haven't. I've voted for Republicans and Democrats. I've been bummed and disappointed in the past, but not scared. I'm also reflective. I've read posts on social media today that chided people to grow up, move on, accept the results and stop positing political crap. I get it. I really do. I think we are all beaten down by this looooooooonnnnggg election cycle. It's inane. I think we've had enough of the negativity, the name calling, the hate. But here's the thing - I voted for Obama twice. When people were posting on social media after the second election (I wasn't on social media after the first) and upset and frustrated that their candidate didn't get elected, I understood. I might not agree with their reasoning, after all I had voted for the other person, but I respected their right to do so. Today I feel like I'm constantly being told to be quiet. I'm not a complainer by nature. If you know me in person, I think I'm typically pretty positive. And while I get the desire to move on, please respect that some of us, over half the people that voted, are grieving. Give us a chance to catch our breath. I had a friend question why I supported Clinton today. Clinton is not perfect, I know. However, I cannot look at my family and/or friends that are Muslim, Hispanic, or Black and vote for another candidate. To my friends and students that identify as LGBTQ, my heart breaks. I held a few of them today while they pulled themselves together. I worked hard to pull myself together. Another friend asked me today if this would really be an issue at school. I had to pause to recover from the shock. I don't think the world has a clue what happens inside of the walls of our schools. As a teacher I have dried more tears than I think anyone can imagine. I've dealt with students who have lost much, who are a danger to themselves, who are hurting. I am not a social worker, but every. single. day. I am called to be one. To dismiss the toll it can take on a teacher is callous. I have cried and worried over more students than I can share. I think when you work hard to build close relationships with them, they come to you with even bigger burdens. This job is hard, but there is nothing I'd rather do. From twenty-one years of experience, I know that after a presidential election there will be students who are upset, angry, frustrated. To make our classroom work, I have to meet them, comfort, and give words to help them move on. It doesn't matter if I voted for the candidate who was elected or not, this is my job to be there for my students. For what it's worth, I've never told my student who I'm voting for. They've always been split, tending to believe I support the same candidate they do. I'm not there to make them believe what I believe, I'm there to love them and teach them. That's what we do. Teachers will be the ones dealing with the fallout from this election. Whether you voted for Trump, Clinton, or a third party candidate, know this. A teacher dried the tears of a child worried about the color of their skin today and how they fit in this country. A teacher hugged a child today and explained that their parents' marriage was still recognized in this country. A teacher comforted another child who was targeted with hate speech for their support of Clinton. A teacher sent homework home for a student afraid to come to school today. I know this because I've talked to these teachers and heard their frustration today. We are here. We will keep teaching kids. I will teach them to come together to support our new president because he will be our leader. We must listen to each other. We are hurting - on both sides of the political aisle. This election is a statement. There are people I love that voted for Trump and people I love who voted for Clinton. We need to remember how to have discourse. We need to look for common ground, and we will. But don't belittle one another. Don't degrade each other for mourning this election results. Today I taught seventy-five students. Looking in their beautiful faces, I see the potential of our country. I was reminded of the good in each other. We are all human. We need to take care of each other. Now is the time. Please be kind. This video today from John Green is well done if you are interested. One of my most recent reads and a title on my Mock Newbery list. I've done "Mock" units for the last few years with my fifth graders - they are two of my favorite things of the school year. With the move to middle school, I figured these might have to go by the wayside. I have way less control of when I can have my students. Our units are tied to another classroom in seventh grade and I can't just pause and teach a unit that they aren't. So, I figured I was done. As always, I read more and more great books. I told my students it is like filling out a March Madness bracket for me. I sit and think which ones will be in the discussions. And I could just talk to my friends about this, but I love getting the reactions of kids. So I began to plan. First, it was the Mock Caldecott. I talked to my friend Margie (or the brilliant @loveofxena on Twitter.) Could she pair with me again? We debated how to get a class of kids for each of my three classes. She had just moved back to Michigan, there were a few options, but it seemed tricky. And then it hit me, we'd make it a low key year and just pair up with Margie! Our plan is simple. We have 22 books (because we couldn't narrow it to 20) and I have an area dedicated to them in my room. I have a handout for my students that has a spot to evaluate each book. They will read them on their own, with friends, or a few with the whole class. Then they will evaluate them and leave a note on Padlet sharing their reactions with their classmates and Margie. In December I will have each of my sections vote, write up the reasoning for our winners and we will Skype with Margie (and her new puppy!). We will share our results, she will share hers. I cannot wait. Margie and I had a blast picking our list of 22 books. I have no idea how many Voxer messages went back and forth, but it was weeks worth. We agonized over what titles to include. Settling on 22 was difficult, but so much fun. It made me begin to have that desire for a Mock Newbery club. I'd always run it outside of class - before school or at lunch. I didn't have enough time, though, right? I shared my desire to try it with Margie and she - like always - encouraged me. I brainstormed a list with my friends and had 20 pretty quick. I threw the idea out to my students - if we had it before school - once in December, once in January, and then a party to watch the lifestream, would kids come? I was met with an enthusiastic yes, but a request to move it to lunch. Apparently the band meets before school. Who knew? So lunch it will be. The only other hurdle was that some kids that aren't in my rotation wanted to join in. I told their friends the more the merrier was my motto, so off we go. The students, like in previous years, won't have to read all 22. They need to read at least two titles to come in December, and two more for January. They get to argue for their title, or argue against it. They tend to be pretty passionate about them overall. Trying the Mock units in the middle school setting has certainly not been without issue, but I have a feeling I'm going to love sharing and enjoying these texts with my students. When January 23rd's award announcements arrive, we will all be cheering for our favorite books. There isn't anything better than that. If you are curious about our book choices for this year's units, check out the lists below. **Disclaimer - there are so many worthy books that didn't make our lists. Please check out Mr. Schu's constantly updated lists of the "Best Books in 2016" for even more great titles. Find it HERE. 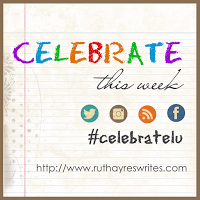 It has been awhile since I joined Ruth Ayres and her community for a celebrate this week post. (Check them all out here.) With my goal of writing each day in November, I thought it was the perfect time. Yet what to celebrate? My heart has been heavy of late. There is so much negativity abounding in this world. I made a huge mistake of watching network TV two nights ago and saw my first campaign ads of the season. I guess I had a good run, the election is only a few days away. Unlike years ago, I can't just avoid the negativity rained down from commercials, I open my Facebook app and it is all right there. I cannot surround myself with the hate. It makes me curl up, fall into despair. How can a world this beautiful hurt so much? How can we forget to love all of our people, not just the ones like us? I begin to search, desperately, for the light. As always, it is there, just waiting to be found. 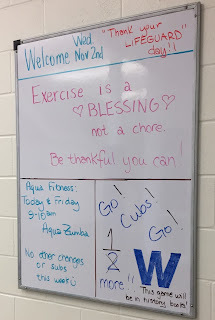 I see the good in the daily message at my local YMCA. I love swimming, but am not a fan of actually getting there. 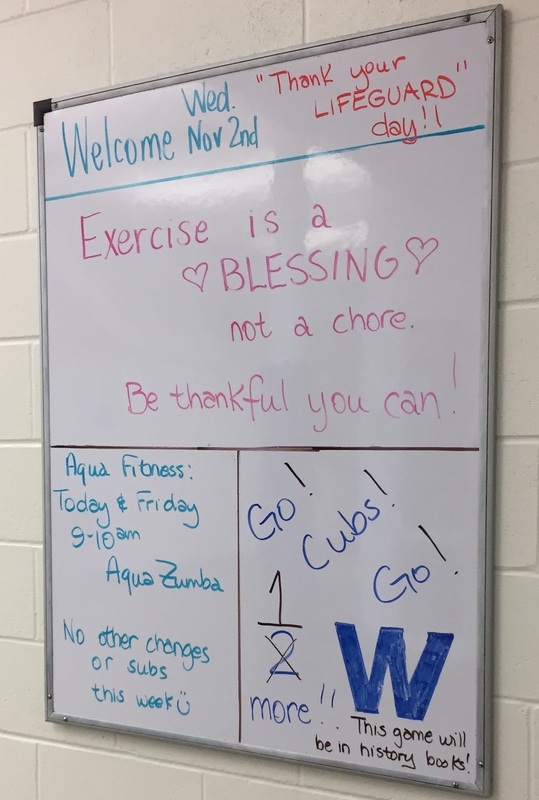 Each time I walk to the back, turn to the locker room, I see the whiteboard. There is always a positive message waiting to be found. I see the good in my students. I love teaching them all, but I especially enjoy my Friday morning advisory group. It's a mix of students I have in class and those that I don't get to teach. Each Friday is something different, yesterday we wrote letters to Veterans. I love the easy start to the last day of my work week. I see the good in readers. Whether they are my own children snatching books out of my mail, or my students who come into our classroom with a deep sigh of relaxation and fall into the book they pull out, they give me hope for our future. 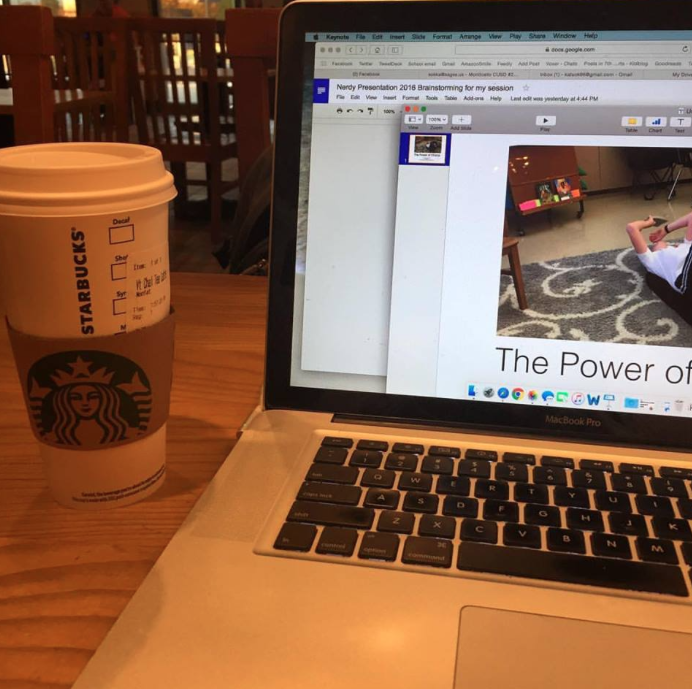 I see the good in my husband, Chris, who is fine with me fleeing 23 miles to Starbucks so many days. It is where I can write, I can focus, I can finally let myself breathe. I see the good in kids. Watching them play basketball, give it their all, and - in our case this time - come up on top. I love when I can see glimpses of the players they will become. I love when I see the sportsmanship that makes my heart shine. I love when I see an unselfish pass, a teammate cheer on and encourage another. That is the true win. I see the good to be found in strangers. I pulled myself out of bed early today - walked the dog and was sitting down in Starbucks before 8am. An elderly lady came in, ordered a drink. The barista rang her up and I could tell she was confused. She looked back at the prices listed above and then said quietly to him that she didn't have enough money, just to cancel her order. He looked at her, smiled, and said he had this one. My eyes filled at the kindness of this college student and I had faith in humanity once again. This post is part of my effort to do NaNoWriMo in my own way this November. Instead of writing 50,000 words towards a novel, I'm trying to get writing back into my life on a regular basis. I'm challenging myself to write daily - notebook entries, articles for Choice Literacy, blog post, you name in. Let me know if you are participating in NaNoWriMo yourself. I'd love to cheer you on. Day two, done! I was pretty worried about moving up to 7th grade from 5th. I wasn't sure if the kids would still connect with me the same. How do you connect with teenagers, or kids on the cusp of being a teen? I've never thought of myself as a fun teacher, one that jokes around and has a good time. I have nothing against it, that just isn't me. What I think I am is pretty quiet, sincere, and I wear my heart on my sleeve. I think my fifth graders (and fourth graders before that) know I love them and will do anything for them. But how would that translate in middle school? Is it ok to be that serious? Would they still enjoy my class? I know enough about kids to know when they are invested in the class, they work harder. I wasn't sure if that would be an issue. I'm grateful to say it hasn't been. Strangely enough for me, teaching 7th isn't that different than teaching 5th. I let my love of reading and writing fly. I hug kids all the time, have cried during multiple lessons this year because I was moved by our topic, and have shared books more than I ever thought possible. I love my seventh graders. They are at such an awkward age, one I clearly remember. I love seeing what they can do, giving them a goal, and watching them demolish it. More than that, I love seeing them get the confidence to take the steps towards the person they are meant to become. One element that has surrounded us this school year, both literally and figuratively is books. I've shared my reading life since day one of our school year. Every book I read, I share, and I read a lot. Book talks are a natural part of our day. Time for independent reading is non-negotiable. As I've been crafting a Mock Caldecott list with my friend Margie, my students have laughed at the amount of messages she and I have sent back and forth trying to come up with a list of 20. (Unsuccessfully, I might add. I think it's now going to be a list of 22. Too many good books!) Today when I was talking to one of my students about this list she laughed and said, "You both speak the language of books." That phrase stopped me in my tracks. As I turned from her to give a reading recommendation to one kid, I saw my classroom a bit differently. I stood by the shelves getting ready to recommend Pictures of Hollis Woods while a group of kids confer about their favorite book on the couch, and a pair of girls discussed what on earth Westerfeld's Uglies was really about. An eighth grade returned a book she had borrowed saying it wasn't for her, but she was reading another one I recommended and loving it, while a sixth grader came in sure I had ordered the new book in the Diary of a Wimpy Kid series. (I hadn't! Need to remedy). Our classroom is filled up the brim with the language of books and I love it.